I send two newsletters per year. One in May and one in November. But this spring has been so intense that the newsletter did not get away until now in July. If you are not among the more than 9,000 who already receive my letter but want my letter, go to the first page and scroll down at the bottom of the page. There you can fill in your name and email address. It was really fun to write the newsletter this time since it's happened so much the last six months. 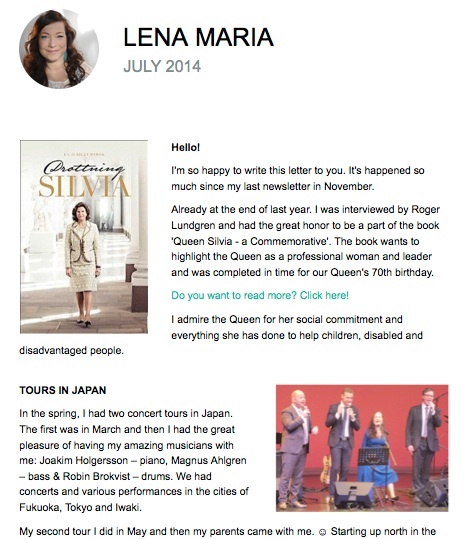 I got to be a small part of a book about our Queen of Sweden, did two tours in Japan, opened the "Shop Lena Maria" etc. etc.